Velkommen til Norse Glee Club nettside! Welcome to the Norse Glee Club web page! The Norse Glee Club was established on November 2, 1928. The Norse Glee Club is a member of the Norwegian Singers Association of America and also a member of the Sioux Valley Singers Association. The Norse Glee Club meets to practice under the direction of Lyle Kroon each Monday night at 7:30 p.m. from the Monday after Labor Day in September until the middle of June. A yearly Sangerfest is the culmination of all of that practicing. The Sangerfest is usually in June and each Sangerfest is hosted by one of the men's singing groups. 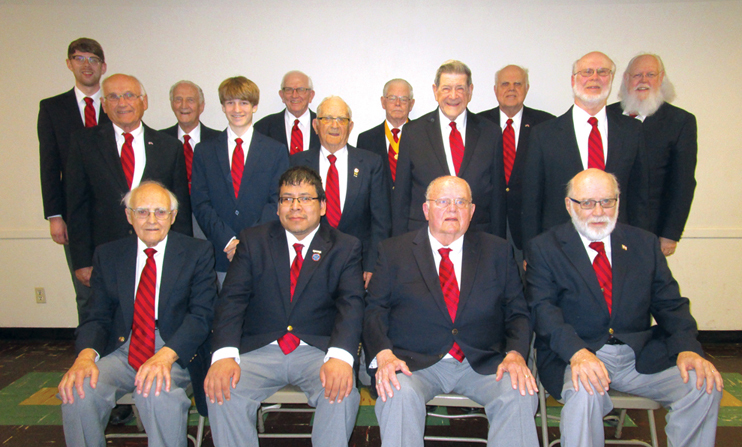 Several singing engagements during the year are enjoyed by the chorus, including the annual Festival of Men's Voices (which is a benefit for The Banquet in Sioux Falls) and the National Anthem at the Sioux Falls Pheasants ball field. The Norse Glee Club is open to all men who enjoy singing. Although they sing several Norwegian songs, they also sing Danish, Finish, Swedish, and a lot of English songs. It is not necessary to know how to speak and understand these languages to sing them. Lyle's expert direction and grasp of the language phonetics makes learning the songs easy.